Sky broadcasts first live 3D TV event | What Hi-Fi? The broadcast was part of a 3D music event co-produced by Sky, specialist 3D production company Nineteen Fifteen Productions and Island Records to coincide with Keane's live performance at Abbey Road Studios in London. Sky broadcast a simulcast of Keane's live gig and transmitted it over a high-definition satellite transponder, then displayed the broadcast on a 46in Hyundai, 3D-Ready high-definition TV. A separate 3D webcast over the internet allowed fans using traditional anaglyph red and green glasses to watch the gig in 3D on Keane's website. A test broadcast was also sent via a satellite downlink to a Vue cinema fitted out with 3D equipment. Using polarisation technology, Sky says this is the first time a live event has been broadcast to a domestic 3D TV in the UK. Gerry O'Sullivan, Sky's director of strategic product development, says: "Being able to broadcast a live event in 3D is a real breakthrough, as previous demonstrations have relied on recorded material." 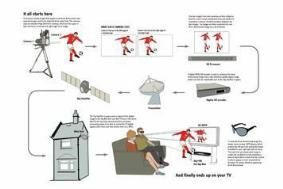 The 3D content was delivered using Sky's existing Sky+ HD infrastructure, including cameras, transmission facilities and satellite uplink/downlink. Playback was from a standard Sky+ HD set-top box. Last December Sky broadcast recorded demonstrations in 3D of Sky 1's Gladiators, an England vs New Zealand rugby match and a Liverpool vs Marseilles Champions League match.